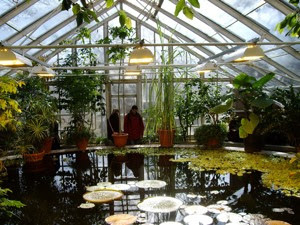 I am lucky, as the Oslo Botanical Garden is located in my neighbourhood, in the gardens of Tøyen Hovedgård, an old manor house dating back to the 1680's. The garden of the manor is a horticultural and historical gem in the middle of city. This is the spot to be during spring when the first flowers are in bloom, as well as in fall, when the foliage of the large trees are coloured red, orange, and yellow. The two small green houses date back to the 19th century. 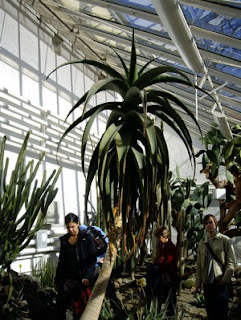 They are old and partly decaying, but inside them you find a surprising collection of plants from different continents. There are plans to build a new large circular green house close by, but sadly in a country swimming in milk and honey, this certainly has taken its time. But as we wait, we will have to walk in the old green houses, and they certainly have their charm. The largest of the two houses is the palm house (right and on top), built in 1868. This is the only greenhouse that allows large tropical plants to grow into full height. Sadly that did not help the specimen of Canary Island Date Palm, brought back by Christen Smith in 1815. It grew from one of the seeds from one of his journey. 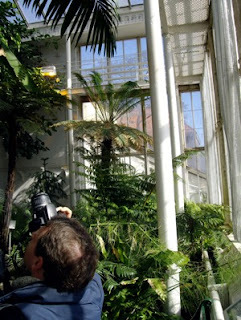 This plant grew in the palm house for close to 180 years before it died in the year 2000 of old age and lack of space. But the palm house contains many other beautiful tall tropical palms and in the middle of the picture you see a large cycas, not a palm but related to the conifers. In the palm house you also find large specimens of ficus benjamina, banana, and other palm varieties. 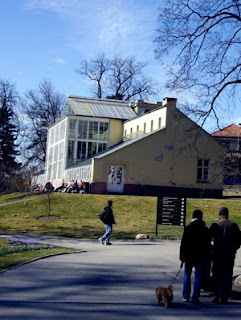 There are two small green houses connected to the palm house. 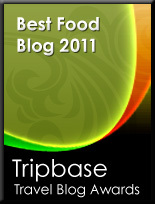 The most interesting one is the desert house, where you have cacti and succulents. 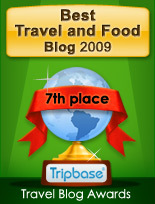 The desert house is temperate during winter and hot during summer. There are several plants here of considerable age. In the middle of the picture you see an aloé variety, and left in the picture you see a large succulent plant of the Euphorbia family. At the right of the picture you can get a glimpse of a large cactus plant of considerable age, and you find many other interesting plant species. Climbing on the wall you can admire "The Queen of the Night", a cactus variety that blooms one night in the year and has the largest and most impressive flowers you can think of. The Victoria house is the second greenhouse in the garden, and it was built in 1876. It is not named after Queen Victoria, but rather a water lily, with the largest leaves I have ever seen. It is said that it can carry the weight of a small child. The Victoria house has three departments. The main house, dominated by a pond with a walkway around it. 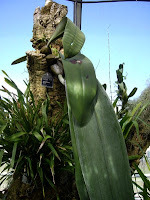 Then you have the orchid house, dominated by orchids, ferns, and other epiphytes. This picture is taken in spring, and you can see the first small leaves of the Victoria in the foreground. 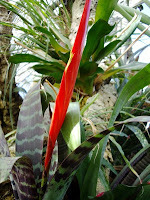 The orchid room contains many species of orchids, ferns, and epiphytes. The latter being plants growing on other trees without feeding on them directly. This room contains species related to the pineapple as the one on the left. These plants are also available at florists and may easily be grown in you own home. 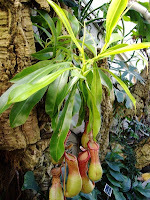 Another interesting plants is the carniverous plant (left) known as Tropical Pitcher Plant or Monkey Cups. These plants grow attached to trees and feed from insects that are lured to its cup and falls into and are trapped in containers shaped like a deep cup filled with liquid. These may also be available at your florists but they require very humid conditions to thrive. And then you have the orchids themselves. Most of them may be very plain, where they grow, connected to the old tree trunks brought in to create the right conditions for this plants. But many of them have the most beautiful flowers and all kinds of colours. Some of them have only one flower as the slipper orchid (Cypripedium), where as other varieties may have stems with a large number of flowers of different size and colour. And you find many interesting varieties in the orchid house in Oslo's Botanical Gardens. A visit to my neighbourhood is well spent time as you can walk in the gardens, but also visit the three museums in the garden. Just across the street you can also visit the Munch Museum. So take the Subway to Tøyen Munch museum and you will have all these sights within walking distance.